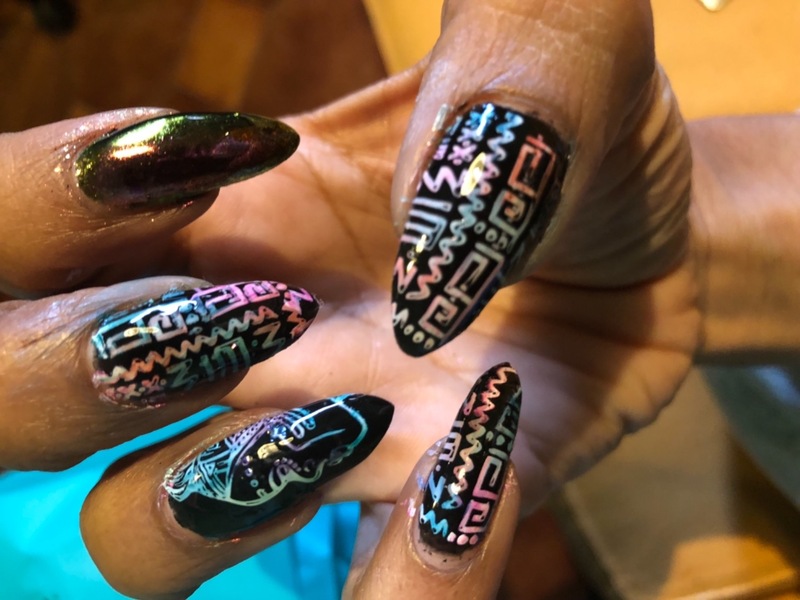 Our Vast Savanna (BM-XL402) nail stamping plate is inspired by the beauty and mysticism behind the many diverse African arts, cultures, and stories. The bold lines and intricate flowing details of this plate accentuate the unique qualities and delicate touch of hand-drawn illustration. Energizing rhythmic patterns dance across your nail beds making mask designs pop in the foreground. Accent your nails with a variety of animal prints and tribal-inspired patterns. This XL (4.25in x 2.4in) plate comes with tons of gorgeous accent, full nail, and buffet style designs to stimulate your creativity. Mix and match your favorite patterns with wild colors for infinite lively nail art possibilities. As with all our nail stamping plates, we use laser-engraved stainless steel, so you'll receive the highest quality and most intricate results. We love to hear from you! Leave a review and share your creation! Super cool plate. Good for my longer nails!